When growing herbs in a garden, it can be difficult to choose which plants to grow. 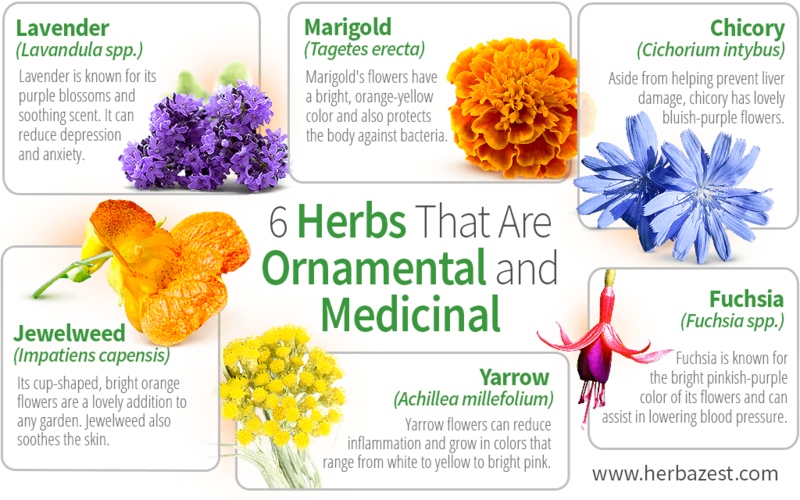 Medicinal herbs are the most useful, but ornamental herbs make the garden into a beautiful sight. Luckily, there are plenty of plants that belong in both categories - like these six herbs, which will add both beauty and functionality to any herb garden. Yarrow flowers grow in clusters of tiny blooms, with colors that range from white to yellow to bright pink, and yarrow leaves are similar to those of the fern plant. It is popular among many gardeners for its lovely colors. In addition, this plant can provide a number of health benefits - most importantly, it can reduce inflammation. A yarrow tea not only can lower fever but also relieve stomach discomfort. Well-known for their delicate purple blossoms as well as their fragrant, soothing scent, lavender plants are a great ornamental and aromatic addition to any herb garden. But lavender's scent is more than just enjoyable - it can actually help to reduce depression and anxiety. Studies have found that lavender aroma alters brainwaves, helping to relax the body and improve mood. A few drops of lavender essential oil in a warm bath can help relax your nerves at the end of the day. The cup-shaped, bright orange flowers of jewelweed, also called touch-me-not, bloom in small clusters along the stem. As many other Impatiens species, its beautiful flowers are a lovely addition to any garden. They also offer the useful benefit of soothing to the skin and can be applied topically on skin irritations, especially the ones caused by burns, to reduce pain. In order to relieve the irritation caused by poison ivy, rub jewelweed flowers directly over the affected area. Fuchsia is known for the bright pinkish-purple color of its flowers, which inspired the name of the color fuchsia. Its beautiful blooms add a perfect vibrant touch to any garden. Additionally, fuchsia has a number of health benefits. Notably, it can be used to help lower blood pressure thanks to its high content of diuretic tannins, which flush excess of sodium from the body. Not only does chicory have lovely bluish-purple flowers that will add a nice touch of color to your garden, but it also can help prevent liver damage. Chicory contains the active compounds lactucin and lactuprikin, both of which have been shown a hepatoprotective action, and even help reverse liver damage that has already been done. A chicory infusion will encourage bile flow and help release toxins by stimulating urination. Often confused with the also popular calendula, marigold's flowers (also known as Mexican or Aztec marigold) have a bright, summery orange-yellow color and a distinctive pompom shape that make them stand out in any garden or backyard. The leaves and flowers of marigold can be made into herbal remedies, which are usually taken to protect the body against bacteria. Marigold receives its antibacterial properties from its flavonoids and terpenoids, which are effective at killing many different types of harmful microorganisms. When growing these healing herbs, there is no need to choose between beauty and functionality. Any of these ornamental plants will add a splash of color and beauty to your herb garden, and each one owns unique healing applications. So choose plants that are both eye-catching and medicinal, and double the benefits of your garden! Plants For A Future, Impatiens balsamina - L.